ARE you running right and left in the morning looking for your stuff? Do you spend long time locating your keys? Are the papers piling on the disk forever? Are you planning to spend a day-off sorting your stuff out? Is your answer was yes to any of the questions above that means you need to read this book. 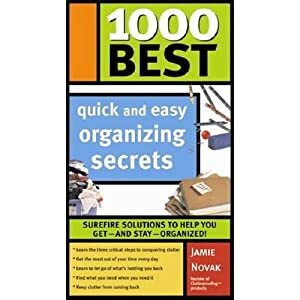 In her book 1000 Best Quick and Easy Organizing Secrets Jamie Novak writes more than 400 pages of clutter-free tips and pieces of advice. The book is easy to read by everyone as it is divided into tips, each of which is few lines long and directly to the point. The book is not meant to be an academic reference on space management or ergonomics, rather, a mini guide to getting rid of junk. The provided tips are costless and focus on the reuse of the available facilities. The book starts with a simple definition of clutter, followed by telling 33 reasons of why things are being accumulated. Some reasons include convincing ourselves of the need of the stuff, the profound love with certain possessions, and the too- good to-keep mentality. Jamie argues with the taken- for-granted rules and introduces alternative way to thinking about things. The author treats critical issues such as separation (from stuff) anxiety, procrastination, stress free holidays in just few tips and steps. The book equips the reader with clutter proofing essentials and golden rules of storage to pave the way for implementing them every day and in every living and bedroom, in entryway to bathroom, and from garden to craft areas, and then it moves to dealing with papers and documents including financial records and statements. The book then moves to dealing with more interactive issues related to family, children, weekends, work and shopping. The book provokes the use of simple actions rather than complicated ones, planning ahead, to-do list, grouping similar things together and how to utilize free minutes during the day. It enhances the tendency of placing things for one time and forever, and teaches how to be less attached to things. The book would help in improving time management skills and reduces stress. While we need to appreciate the holistic clutter proof lists, they are sometimes repetitive and someone may feel that the same topic is being rewritten again or the same tips are being restated differently. The advice lack the evidence of whether or not they were effective. The book sounds like someone is thinking loudly in community presentation, while this makes the book friendly to use, it is making it hard to be believed. Tips are treated equally in terms of importance there is no direction on what needed to be done first. أكملت بعض النقاط الجيدة هناك. قمت بالبحث عن موضوع وجدت أن غالبية الأشخاص الذين سيكون لديهم نفس الرأي مع بلوق الخاص بك.